Like any other mail client, also Mozilla Thunderbird needs an outgoing mail server to work correctly. The configuration process is easy: you just need to enter the right parameters of your outgoing (SMTP) server, and Thunderbird will use it to deliver your emails. There’s just one thing to underscore, though: if you rely on a common outgoing mail server like Gmail’s or Yahoo’s and plan to send multiple emails (like a newsletter) with Thunderbird, you will probably run into some delivery issue. That is, a great part of your messages won’t get to the recipients’ inboxes, and the reason is very simple: a “normal” SMTP server is not suitable for email marketing or bulk mailing in general. So our advice is to try a professional outgoing mail server like turboSMTP, that can ensure you the highest delivery rate – and also provides a handy free plan. Description: a name whatsoever for your SMTP server. Server Name: your outgoing mail server address. If you’re using turboSMTP, it’ll be pro.turbo-smtp.com; if you’re not, have a look at our list of the most common SMTP server hostnames. 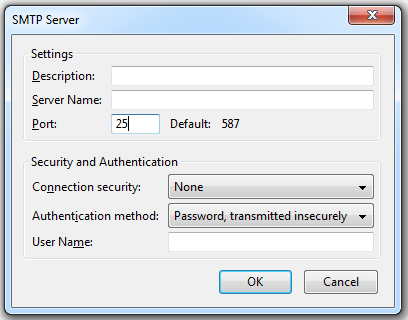 Default port: type 25 or 587 (for further information check our article about SMTP ports). Connection security: either none or via SSL. Authentication Method: you can choose among different options. For further information, check our article about setting up a mail client. Click “OK” and there it is, you can start sending out emails with Mozilla Thunderbird.